When we’re bored, we bake! 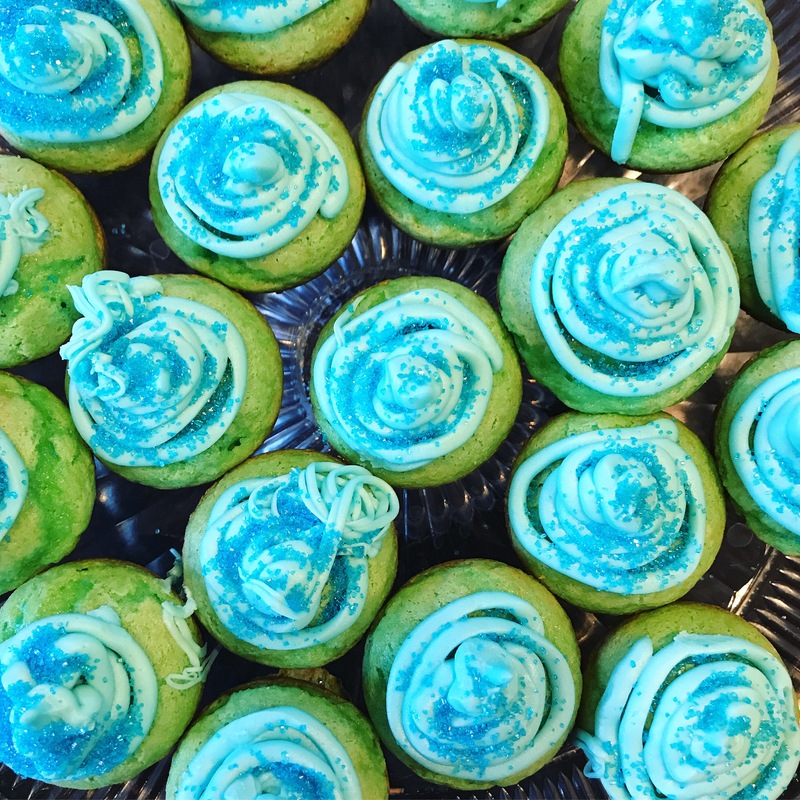 And of course Liam wanted something blue so he got EVERYTHING blue 🙂 He actually did most of the preparing for these blue cupcakes besides pouring the batter into the pan and piping the frosting. I know, I know… it looks like a 4 year old did it but I don’t have anymore piping bags and the ziplock bag I was using sprung a leak! It did not take long to make these little guys. They are mini cupcakes (not sure if you can tell by the pictures) and I used a box of Pillsbury cake mix. Half a box of cake mix actually. I needed to use it up and you know I LOVE cake so here we are! Super BLUE cupcakes. I will give the recipe I used below, but you can also just use an entire cake mix and add food coloring. Same with the frosting. Note: White cake mix would be better, obviously. Ours came out a little on the green side since the batter was yellow. Preheat oven to 350 degrees Fahrenheit. In a bowl, beat all ingredients for the cake until well blended. Pour into prepared cups about halfway full. Bake for about 12-13 minutes for mini cupcakes, longer for regular size. Allow to cool on a wire rack before removing the cupcakes from the pan. Cool completely out of the pan while you make the frosting. For the frosting, beat butter and 1 cup of sugar until smooth. Add in milk and vanilla and beat until combined. Add in food coloring and more powdered sugar until you reach desired consistency. Frost cupcakes, decorate and enjoy! Store covered at room temperature. OMG! They are so cuite! Way to go Liam! Yes! And I was just at Michael’s and they have the cutest cupcake decorations!